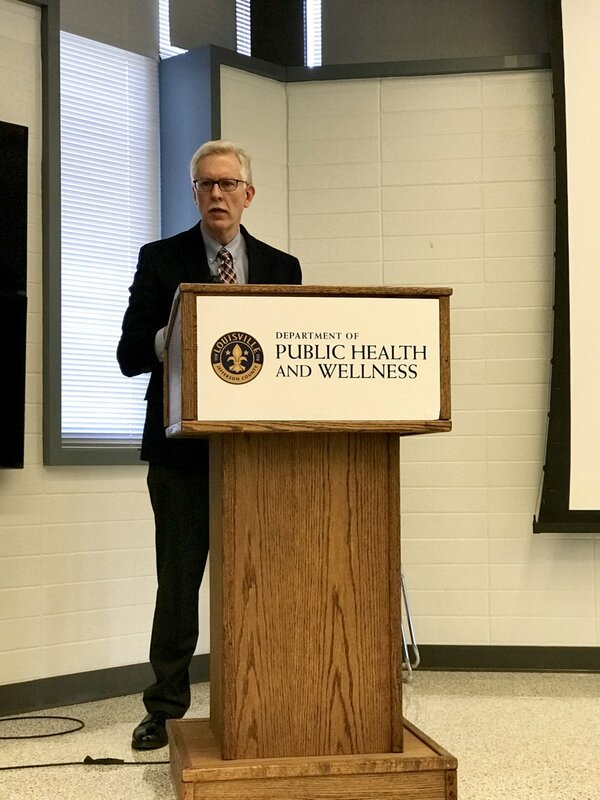 On February 27 the Louisville Health Advisory Board (LHAB) held its first quarterly meeting of the year at the Louisville Metro Department of Public Health & Wellness. Over forty LHAB members representing twenty-two organizations from across Louisville attended and participated in the collective forum. 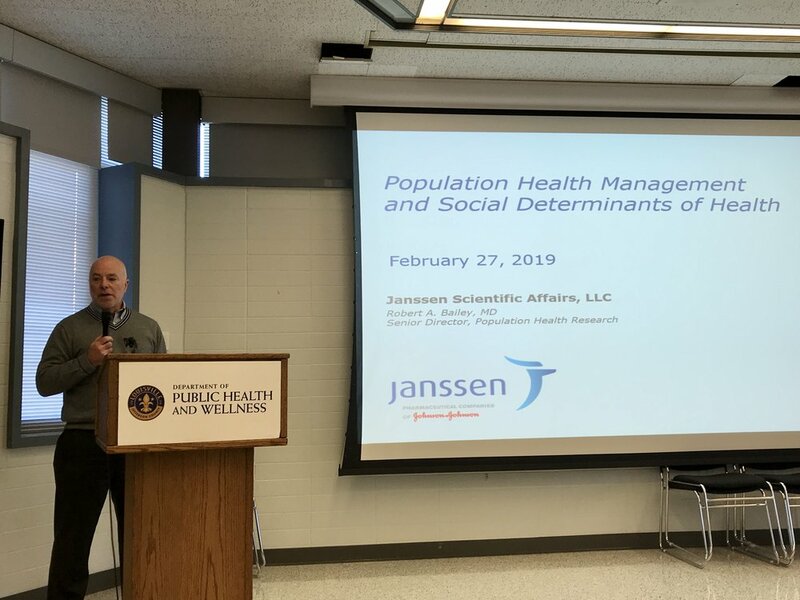 The keynote speaker - Dr. Robert Bailey, Director, Population Health Research, Real World Value & Evidence, Janssen Scientific Affairs - presented on his experience as a researcher in population health management and highlighted case studies that address social determinants of health. He also shared Janssen’s perspective, as a pharmaceutical company, on why addressing the social determinants of health are important. Following a discussion with Dr. Bailey, attendees reflected on the work of the past three and a half years and began to discuss strategic direction moving forward. Dr. Robert Bailey discussed the nature of population health research and how healthcare has evolved in recent years. Historically, allocated spending has been focused on clinical care, including access and quality of care. However, clinical care only has a 10% effect on outcomes whereas genetics have 20% and external factors have 70%. The external factors are further broken down into health behaviors, physical environment, and social/economic factors. Additionally, Dr. Bailey called attention to several case studies that addressed social determinants of health and emphasized the importance of physicians being aware of how these factors affect certain populations. One referenced study examined the relationship between hypoglycemia hospitalizations, food security, and income. It found a connection between these hospitalizations and the pay cycle and food expenditures of low-income households. To maximize the effectiveness of population care outcomes, Dr. Bailey provided a 3-part equation to deliver the right care to the right patient at the right time. This includes working to make better predictive models so treatment can be proactive rather than reactive. Louisville Metro Department of Public Health and Wellness Director and LHAB co-chair, Dr. Sarah Moyer, reflected on the accomplishments and value the LHAB cultivated over the past several years and raised the question of whether the LHAB should stay on same course or evolve its direction to focus more on systems. She shared the direction the health department is taking towards addressing the social determinants of health, or root causes, rather than focusing on specific diseases. This shift means that the department is relying on community partners to provide health services, such as vaccinations, while the health department focuses on addressing inequities and system changes. When thinking about the future, it is important to consider how LHAB’s goals and the community at large will be affected by this shift in priorities, in addition to the recent budget cuts that will also impact health services in our city. Putting a stronger focus on making sure that LHAB represents the many stakeholders we touch because investing in diversity and taking inclusive approaches are the fuel of community transformation. The need to connect to and understand other local collaboratives. When informally polled, only 2-4 individuals knew of the following programs/initiatives: Health Enterprise Network (HEN), Kentuckiana Health Collaborative (KHC), Foundation for a Healthy Kentucky, Louisville Resiliency, Worksite Wellness Council and Louisville Entrepreneurship Accelerated Program (LEAP). London Roth, Humana, shared that other Humana Health Advisory Boards have evolved their structure and many committees no longer meet monthly; also the Clinical Town Hall has transformed in other cities and there is an opportunity for us to re-design that forum to better meet the current LHAB focus. Formal committee updates weren’t presented, however, during the larger conversation about the LHAB, several members provided updates on the committee work that helped inform the conversation. The Behavioral Health Committee is focused on expanding Question, Persuade, Refer (QPR) training, specifically to businesses and parents. They are examining methods to prevent mental health issues that lead to suicide ideation. Jan Sherrell co-chair of the Community Coordination of Care Committee gave an update on United Community and Tom Walton, co-chair of the committee, shared the research being done on best practice business models that could be useful in the committees work and highlighted the pilot being led by Family Health Centers to utilize the PRAPARE survey. The LHAB looks forward to sustained strength and impact in the community. Stay tuned for an invitation to our next quarterly gathering on July 18.